Stephanie and Ty Dickey's shop has plenty of cool items, like a comic book based on their adventures in fashion.Stef-N-Ty is filled with colorful fabric patterns. David Freeman thinks barbershops are great places to socialize. And Freeman, who works at Transformations Barbershop in North End, is something of an expert on the subject — he’s been cutting hair for most of his life. "The barbershop has a good element of people," he says. "It’s the kind of place where everyone talks to everyone, where Transformations Barbershopthey feel free to let out frustrations. Come here on Sundays, and there will be some good conversations." On a recent Thursday, Freeman is giving a buzz cut to Andrew Burnett Jr., a longtime customer. Burnett likes that Transformations is located near his home in Detroit's Arden Park-East Boston neighborhood. It’s a quick commute for Freeman too, who lives right around the corner from the shop. "I’m glad we got something close to here that’s more convenient," says Burnett. The block offers potential customers and passerbys plenty of other options besides getting a haircut. Visitors can also buy a hat, purchase snacks and beauty products, hang out at a bookstore and record a podcast, or even pay a visit to State Senator Adam Hollier's office. That's because Transformations is just one of a cluster of businesses located in a retail complex on John R Street between Westminster and Kenilworth Streets in North End. The clothing shop Stef-N-Ty and KAN Books also make their home in the building, and the natural home products retailer Pink Elephant is planning on opening its doors at the complex later this month. The unique mix of accommodations that can found on this strip of John R. is the vision of developer Steven Harris. He grew up in the neighborhood and is now helping to revitalize business in the area with his design and building company Rebound Construction. Harris' decision to invest in the neighborhood came a few years back, after attending a bunch of economic development meetings that talked a lot about bringing business to North End but always seemed to be short on results. "I just got tired of meetings," he says. "So I said, ‘Look, I'm going to buy a piece of property and show you how a small amount of money can make a big difference in a small neighborhood.'" Harris purchased the John R building for around $10,000 in 2010. It was in rough shape when he first got it — both the roof and the front of the building were collapsing and demanded immediate attention. After doing repairs on the walls and roof, the space was ready for its first two tenants, Transformations Barbershop and Miss Lottie’s Ice Cream & Candy Factory. Both opened for business in 2012. Harris named the ice cream shop after his grandmother, who had a reputation for selling candy and dinners to neighborhood residents. After years of investment, the structure has considerably improved. Today the brick building, painted in complementary shades of tan and gray, has a modern and unified look, with stylish marquee letter signs for each business. This year, Harris wants to activate the space behind the building, turning it into an art park with a section for dog-owners and their pets to hang out. He's interested in adding seating and has prepared the wall for an artist to paint a mural. The park will no doubt add to the foot traffic that his tenants are already bringing to the area. Stef-N-Ty has certainly been turning heads with its one-of-a-kind handmade hats made from upcycled materials like leather and denim. Owned by the husband-and-wife team Ty and Stephanie Dickey, the apparel shop's roots actually stretch all the way over to New York City. Stephanie got her start designing menswear in the Big Apple back in the 1990s. Her interest in hatmaking resulted from an experience where she was unable a hat that fit her needs. So she started making her own, and her husband began selling them on 125th Street in Harlem. 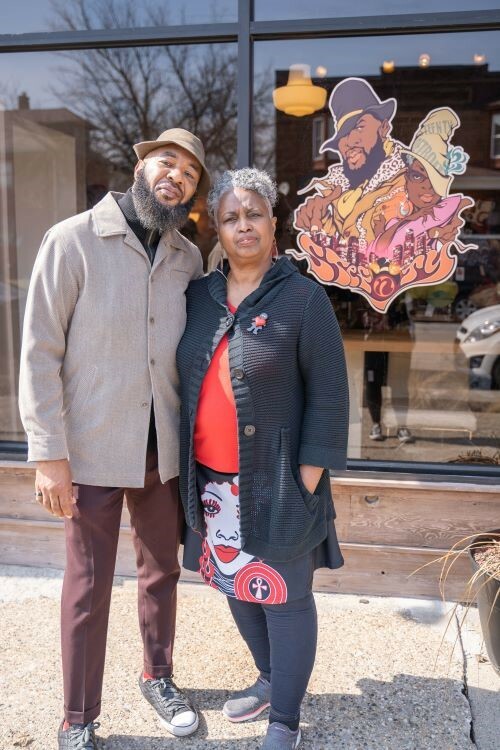 As the business grew, they relocated to a number of other cities, including Baltimore and Chicago, before making Detroit — their biggest wholesale hat market — their home in 2010. Ty and Stephanie Dickey"We wanted to be part of the change happening in Detroit, and support the community," says Stephanie. The Dickeys have been on the block for about two years now. Stef'N'Ty takes up two floors in the building. Their hat and vintage clothing shop sits on the on the first floor, and upstairs there is a production space where Stephanie crafts her unique hats. Bathed in natural light, the top floor resembles a cozy sewing room, while downstairs, a room of exposed brick walls with a wooden counter surrounded by white seats and filled with the deep sounds of house music, is suggestive of a lounge. In addition to the Dickey's hats and clothing, patrons can also browse through a selection of jewelry, bags and candles made by other vendors, as well as action figures that bear the Dickey's likenesses and even a comic book titled "Stef-N-Ty, Fashion Fighters." "The shop is a reflection of us," Ty says of the store's eclectic merchandise. Stef-N-Ty also hosts pop-ups and special events, like an upcoming sushi and beats series, which will show off Ty's DJ skills. The couple is also looking into throwing a block party to engage neighbors from the surrounding area. The apparel sellers' relationship with their future neighbor Pink Elephant is already pretty tight. In fact, Stephanie helped bring Pink Elephant's owner Ellen Lyle to the John R. building when she heard the natural product maker was having trouble finding a suitable location for the retail end of her business. At the time, Harris was looking for a new tenant after relocating his construction business' office to his new Grand Boulevard co-working space, Cocoon Detroit. Impressed by Harris' connection with the community, Lyle signed Pink Elephant on as a tenant. "He's really invested personally in that neighborhood," Lyle says. "Because he grew up there, I feel like we're not really in Pink Elephant merchandise danger of him saying, ‘Oh, I'm going to sell this building and kick all you guys out because I can get more rent.'" Lyle, a former science teacher, makes her merchandise at a 200-square-foot makerspace located in Midtown's Green Garage. The space is jam-packed with her own products, as well as other natural, green-friendly goods on what she calls the "continuum of crunchiness," items ranging from natural feminine products to soap nuts. Other than cleaning supplies, she’s planning to stock "everyday-type things" such as dental floss, toothbrushes, grab-and-go snacks and drinks, but to "do that in a sustainable way that’s also affordable." She also wants to set up refilling stations at her shop on John R, so people can bring in their own containers to stock up on laundry detergent and other supplies. Pink Elephant will celebrate its grand opening on April 26, a date that coincides with Earth Week. Once that happens, the storefronts at the John R. building will be fully occupied, and Harris' plan for a thriving retail strip where his building sits will be fully realized. "I wanted to bring in mom-and-pop stores, places where people can get things they needed or wanted, like haircuts and coffee or chips, ... and take care of the normal daily needs of the neighborhood," says Harris. This article is part of a series where we revisit stories from our On the Ground installment and explore new ones in the North End. It is supported by the Kresge Foundation.